You’ve no doubt tried Swedish meatballs at IKEA but have you ever sampled Falukorv? Or do you know what spettekaka and pitepalt are? We’ve made a list of typical Swedish food which you should try on your next Swedish holiday. Read, be tempted, and enjoy! This is a very well known Swedish export, which nowadays is owned by a French company. The vodka is still made in Åhus in Skåne and almost every bottle is made at the Limmareds glass factory in the Västra Götaland region. Absolut vodka comes in many flavours including vanilla, raspberry, pear and of course, the straight and pure vodka. This typical Swedish sausage has had its recipe protected since 1973. Any sausage called a Falukorv must contain at least 40% beef and pork. It got its name from the Falun area in Dalarna where they still celebrate Falukorven’s day. There is even a well known Swedish nursery rhyme “Blommig falukorv” (Flowery Falukorv) about this much-loved Swedish sausage. Färskpotatis, literally ‘fresh potatoes’, are a must for Swedes during the Midsummer celebrations. Only potatoes that have been harvested this year and sold before 30th September can be called färskpotatis. Färskpotatis are often smaller than usual potatoes and are eaten with the peel on because the peel is very thin and often falls off as you wash the potato. Hjortron, or cloudberry in its English name, mainly grows in Norrland which is why it is sometimes called ‘The Gold of the North’. The yellowy-orange berry, which is actually a stone fruit and not a berry, is used to make jams and conserves. Vanilla ice-cream with hjortronsylt (cloudberry jam) is a real treat. Kanelbullar, or cinnamon buns, are so popular in Sweden that they even have their own national day dedicated to them – 4th October is Kanelbullen’s day. 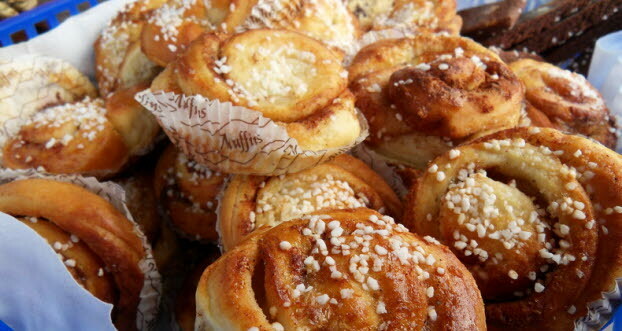 Kanelbullar can be found in other countries, for example in northern Europe and North America, but they originally come from Sweden. The main ingredients in the dough of a kanelbulle are flour, milk, yeast, sugar and butter. The filling is often made from butter, sugar and cinnamon. The tops are then brushed with whisked egg and pearl sugar is sprinkled on top. Kroppkakor is a type of Swedish dumpling. Kroppkakor is a main dish which is associated with Öland island, but is also served in nearby Småland, Gotland and Blekinge. It is made of doughy balls which mainly comprise potatoes, pork and onions. Kroppkakor are usually served with lingonberry jam and clarified butter. In August, crayfish parties (kräftskivor) are arranged in just about every home in Sweden. The real enthusiasts catch and cook their own kräftor but most people buy them pre-cooked. Kräftor are served with bread, butter, occasionally a pie and of course, a glass of Swedish snaps (spiced vodka). If you’re ever at a crayfish party, you will see guests wearing silly hats and the later the evening gets, the better the snaps drinking songs become! Even though most people have eaten köttbullar (meatballs) at IKEA somewhere in the world and associate them with Sweden, the meatball is actually an imported dish. It was Karl XII who brought home this dish from the Ottoman Empire in the 18th century. Köttbullar, small balls of minced meat, are usually served with potatoes, a brown gravy-type sauce and lingonberry jam. Palt is a traditional Swedish dish which is served in many parts of the country but it’s the palt from the town of Piteå in the north of Sweden, pitepalt, which is the most famous. In the village Öjebyn, outside Piteå, there is the world’s largest “paltzerria” where loads of different kinds of palt are served. Pitepalt is similar to kroppkakor (see under K) where potatoes, flour and salt are the main ingredients. Balls are made of the dough, which are then filled, usually with pork, before being cooked in salted water. In northern Sweden reindeer is often on the menu. One of the most common ways to cook reindeer is to make renskav. Renskav comprises dried or frozen reindeer meat which is finely sliced then fried. It’s common to eat potatoes or mashed potatoes with renskav, although lots of different variations exist, for example renskav kebabs are quite popular. Semlor is cardamon buns filled with thick almond paste and whipped cream. A loved child has many names, so the Scandinavian saying goes. Semla is the official name of this popular sweet bun, but some call it fastlagsbulle (fasting bun) or fettisdagsbulle (literally ‘fat Tuesday bun’). It’s made of white wheat bread which is filled with thick almond paste and whipped cream. 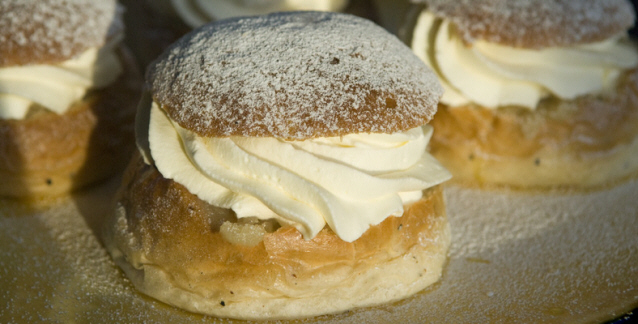 Every year in February on Fettisdagen (Shrove Tuesday), which is the official Semla day, tonnes of semla buns are consumed at cafés, offices, homes and so on. In Sweden inlagd sill (marinated herring) is eaten at most major celebrations: Easter, Midsummer and Christmas. At Midsummer inlagd sill is eaten with färskpotatis (see under F), chives and sour cream, whereas at Easter and Christmas it is only a part of the whole buffet. Inlagd sill means that the herring has been marinated in a mixture of salt, vinegar and spices. Popular types of inlagd sill are löksill (onion herring) and senapssill (mustard herring). A very sweet cake from Skåne which is baked from dough made mainly from eggs, potato flour and sugar. The dough is poured very slowly onto a wooden spit which rotates in front of an open fire or a gas flame. When the spettekaka is ready it is decorated with icing, the colours of which depend on where in Skåne it was made. The easiest way to eat spettekaka is to cut it up into small pieces using a sharp knife. Surströmming is herring which has been conserved through fermentation. The fish is salted and laid in an open tub where it starts to ferment and acid begins to form. After this stage, the herring is stored in sealed cans where it continues to ferment and ripens. Surströmming has a very strong smell and a salty taste. It is mainly produced along the Norrland coast, but it is eaten across the country. The third Thursday in August is the surströmming première.